» What is Clik Clik? Clik Clik is Worcestershire arts producer and curator Kate Cox creating unique immersive entertainment, specialising in outdoor installations, weird & wonderful tailored events and pop-up experiences. “Engaging with the public is integral to my work along with encouraging creativity and breaking barriers through laughter and playfulness”. “With over 20 years experience in the arts, from personal work as a performer and visual artist, to production, promotion, arts and event management and art direction, I can deliver both solo work and/or commission a range of freelance artists, performers and musicians to create the perfect style for the project brief”. 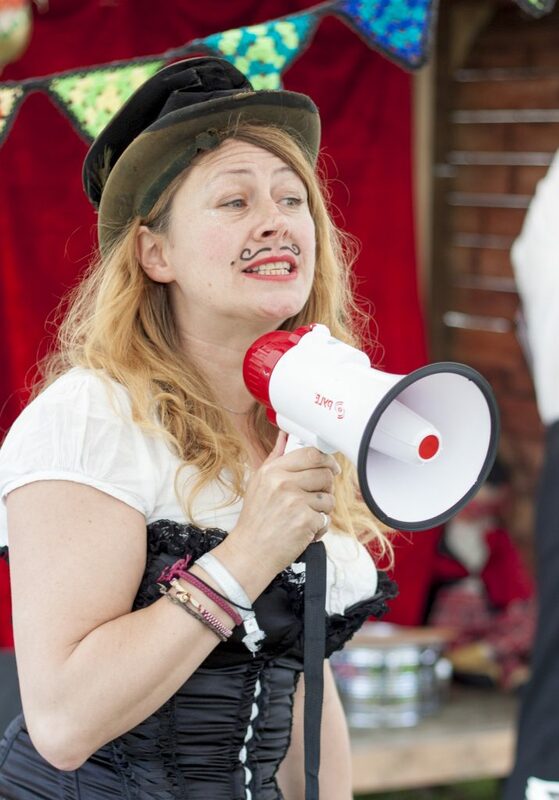 Clik Clik can provide a stack of weird and wonderful, dynamic and truly different creative ideas including quirky entertainment, performance & live music, fabulous decor, photo booth services, arts sessions, bespoke playful experiences, team building and pop-up experiences. Being flexible and catering for all budgets is important and I’m happy to discuss and visualise individual ideas to create something truly unique for events, weddings, corporate, organisations, street fairs, festivals and venues. With event management experience, I also create events from scratch, and can curate bespoke entertainment to suit all manner of visions. Kate had been performing under different guises at festivals since 2007, dressing up and being silly in return for a ticket. At the same time she was pursuing a visual arts path as a textile artist. The name Clik Clik Collective was initially co-created with Worcester based artist and musician Richard Clarke in 2010 to provide pop up exhibitions. Clik Clik Collective curated galleries and art fairs in Worcestershire celebrating local and national artists while Kate continued to follow her passion for an unusual mix of walkabout performance at festivals. In 2013, Kate left her job as Art director/manager of a local arts centre and decided to go solo with Clik Clik taking it in a new direction, by producing two projects; the first commissioned several immersive artists in a sound based experience called ‘Soundabout’; the second collaborated with the band Collective 43 and to create the ‘Voodoo Funeral March Procession’ for the Worcester Victorian Fair. Clik Clik’s clients range from large scale independant festivals such as Boomtown, Nozstock, Green Man, Shambala & regional arts festivals to organisations including The National Trust, County and City Councils as well as private events and venues. Taking the arts to the people, encouraging everyone to get creative, experience something different and most importantly, have fun.